In front of the Rainbow Hostel. The first time I stayed at the Rainbow Hostel, I meant to come for a weekend and stayed for over two weeks. I’ve been returning as often as possible ever since. This past June was my most recent visit. 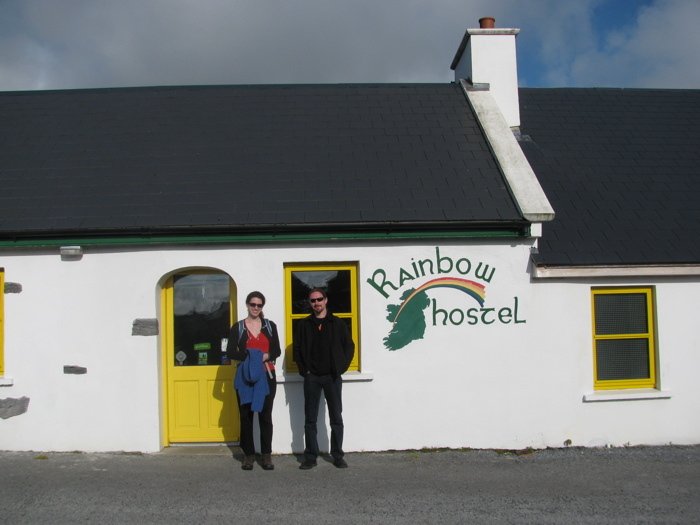 It had been four years since my last visit to Ireland, but when the bus dropped me off at the Rainbow Hostel, Carmel gave me a warm welcome, and I felt like it had been no time at all. Hostel guests on Mattie’s tour. Everything about this hostel is great, but Mattie and Carmel Shannon really make it a home away from home. They’re both so welcoming, and wonderful resources if you have any questions about the area. Carmel runs the hostel (and the B&B next door) beautifully. Her delicious, fresh-baked scones are often available in the hostel dining area in the mornings. 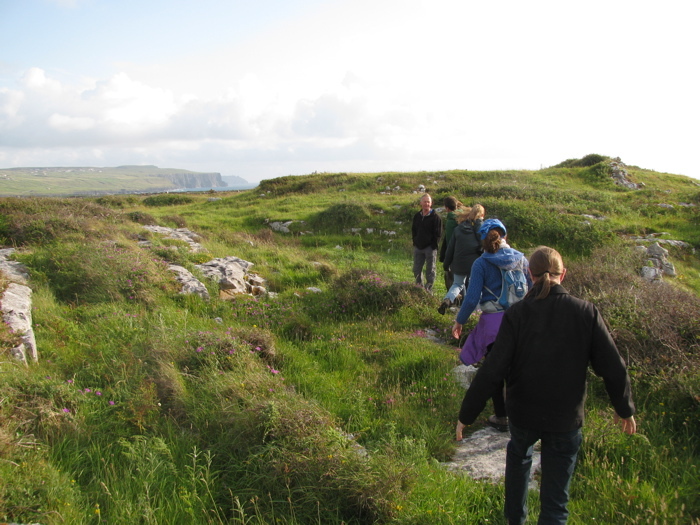 Mattie leads fun, informative (and free) walking tours of the Burren. He points out prehistoric and historic sites, geological features, and wildflowers and plant life that I never even would have known to look for. They both go out of their way to help. in the Rainbow Hostel’s common room. year, I met a Polish couple who stood with me at the bus stop for twenty minutes – in the rain – even though they weren’t leaving that day. I’m still in touch with them, as well as with a Japanese photographer, a French dancer and archeologist, and an American sculptor I met there, just to name a few. Families, couples, individuals, and even the occasional big group all seem to settle right in at the Rainbow Hostel and become part of the ever-changing community there. I know I’m not alone in my enthusiasm for this hostel: The guest books (dating back to the mid-nineties) in the common room contain much the same message again and again: The Rainbow Hostel is a home-away-from-home, a place where you’ll instantly feel welcome and at ease, someplace you’ll be eager to return to. I know I am! The hostel is kept meticulously clean. All the rooms feel spacious and light. The bunk beds in the dorm rooms (where I usually stay) are solid wood, and are super-cozy. The bedding is bright and fresh. The showers have plenty of hot water. The kitchen (recently redone) has three full stovetops, two big sinks, and everything you might need in the way of pots, dishes etc. There’s also plenty of refrigerator space and spacious, lovely wood cubbies for storing food in. You can find tea, coffee, and lots of other goodies on the spare food shelf, as well as on the top shelf of the fridge. There are two solid wood tables to eat at, as well as some picnic tables in the back yard. The common room is my favorite place at the Rainbow Hostel. It manages to be both cozy and bright. There is a small but very toasty woodstove, two cozy couches and several chairs, plus a bookshelf filled with titles in a range of languages. The view out the door is of a stone wall, a lush hillside, and cows grazing outside the ruins of an old stone church up the hill. The location is ideal. The hostel is a short stroll from two pubs, a small food shop, and some restaurants. 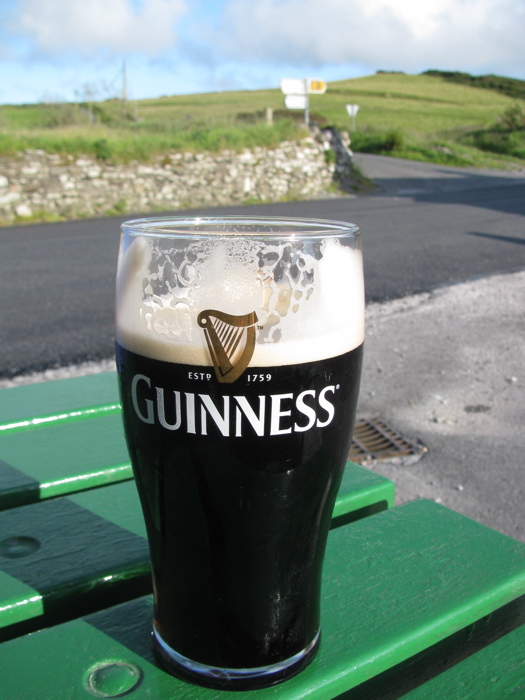 It’s only a short walk to O’Connor’s, the convenience store, and several craft shops. Gorgeous scenery is all around, including the Burren, farms, an incredible range of wildflowers, the ocean, and historic and prehistoric sites. The Cliffs of Moher can be reached by a quick drive or bus trip or a hearty walk. The pier (from which you can take a cruise to the cliffs or day trip to the Aran Islands) is an easy walk from the hostel. a very short drive away. 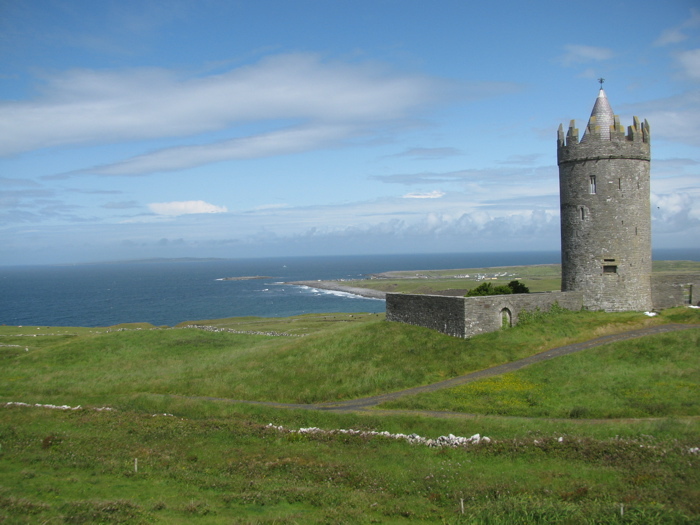 If you have a car, there are tons of options for day trips, including Galway, Clare Archeological Center, the Burren Perfumery, and much more. I’m just as happy without a car, in which case my favorite plan for the day is to have breakfast and tea, go for a long walk (perhaps across the burren, down the coast to the pier, or up past Doonagore Castle) with a picnic lunch, stop for tea and cake at one of the local cafes and spend the afternoon reading or chatting, come back to the hostel for a leisurely dinner and more great conversations, and then head to the pubs for some brilliant live music. Thank you so much to Kasia, one of the brilliant people I’ve met at the Rainbow Hostel, for permission to use these photographs!